Hello All! It's finally my turn on the Wicked Blog Hop! I can't believe that October has slipped by and tomorrow we'll all be looking ahead to Thanksgiving. If you're looking for Needle and Thread Thursday, or even if you're not and you just want to check it out, I posted it a day early because of the blog hop, and you can find it HERE! For my stop on the Wicked Hop, I want to share a little tutorial on a project that can be modified to suit your decor all year long, and will keep away those really "wicked" rings on your furniture! *24 assorted 3 inch squares. This is a great use of small scraps, or I picked up a FQ bundle with five different fabrics and had way more than enough for the entire coaster set. *6 squares for backings, cut 5.5 inches. *and 12 squares of batting, cut 5.5 inches. I wanted to be certain that the coasters were able to absorb a lot of condensation, so I doubled my batting, which is why we're cutting 12 squares instead of 6. To make the tops of your coasters, sew your 3 inch squares into four patches, and give them a quick press. Using your walking foot to be sure that everything feeds evenly, and sew all the way around with a 1/4 inch seam, leaving about 2 inches open. Be sure to backstitch when you start and stop. Remember, you're looking at the wrong side of the fabric on the back! Clip your corners, taking care not to cut your stitches. We just need to reduce the bulk in the corners to make the next step easier! Then just turn the coaster right side out! These are small enough that you can use your fingers, but a chopstick or the eraser end of a pencil works too. Just don't use anything sharp or you'll poke right through your corners! This is where the backstitching is important, because when you turn it, your seam will need to be strong so it doesn't pull open. I am really not a fan of hand sewing, so I like to close my open edge by folding it inside and stitching all the way around the edge of the coaster. At this point, you could quilt it however you want! I know that some spiderwebs would have been just awesome, but I did mention that this was completed in an hour, right? Instead, I set my stitch length to 3mm and opted for a quick square spiral. I didn't get too precise with it. I kept the lines "organic-" which is what I like to call it when I don't care if there's a little wonkiness to it, ha! Once you've got the basic construction down, you can change the fabrics to any holiday or even match your regular decor. You can make the quilting design your own, or even modify the top into any favorite block pattern. Keep in mind though, that the entire finished coaster is only 5 inches- plenty big enough for a drink to sit on, but not exactly a ton of room to show off mad-piecing skills. You know, unless you're into working with teeny-tiny pieces... in which case- more power to you! You could even fussy cut squares for the top and not piece at all! Just have fun with it! So, there you have it! A set of six coasters that would make anybody smile, and will keep away rings on the furniture- because those are really scary! I have a good bit of the fabric I used on this project left over, and since it's time for me to stop thinking of Halloween, and start checking off my Christmas list, I don't have any plans for it. So, I'm offering them as a giveaway! There is one 12x18 inch piece of each fabric left, plus a 5x12 piece. So still plenty for another little wicked project! To be entered in the giveaway, just leave a comment! I'll use Mr. Random to choose the winning number on Monday, 11/4. So the giveaway will stay open through the weekend! Followers will get a second chance to win. So in your second comment, be sure to let me know how you're following! Lots of thanks to Mdm Samm and Wicked Wendy for organizing such a fun hop. By the way, don't forget to check out the final few Wicked Hoppers today! My Quilt Infatuation-yep, you're here! Thanks for resharing this post under our Halloween Tuesday Archives theme Kelly! Oh man....and I'm comment number one....no luck there....just being funny! Wicked coasters! Thank you for the tutorial. Great spooky fabric and excellent tutorial! I follow on my blogger dashboard. Thanks for the chance. So fun! Love them! Thanks for the tutorial. Nice tutorial and love those spooky fabrics. Great job. Love your coasters! Would be tickled to win. Kelly those coasters are wickedly cool and your tutorial is super! Great job :) Thank you so much for sharing on this wicked hop!! These are so cute! Fun to make a set for every season! They are lovely - thanks for great tutorial too. I am seeing coasters in the future......loads of coasters! Loving them. Thank your for the tutorial! Great coasters - thanks for the tutorial! What a cute and easy project. Thanks for the inspiration! Kelly. Very cute coasters. Love your quilting! Very, very nice. Thanks for sharing your wonderful pics, too. Great coasters and tutorial. Thanks for hoping. Great coasters, I love fast projects for instant gratisfication. Thanks for a fun giveaway too. What a cute idea! They would make great little gifts. So cute! These will go on my Christmas gift list for sure. Thanks. I am going to make these in mug rug size, my crowd are a messy lot. I have started cutting the fabric already. To late for Halloween but might make these for fall or Christmas! Thanks for the tutorial on you wickedly fun coasters! It's a great idea for hostess gifts during the holidays. These coasters are so cute and easy too! I will be making some for teacher gifts. Your way is much simpler than the way I was going to do it. Thanks! Adorable coasters. They will be great for all seasons. Thanks for sharing. Thanks for the tutorial. Love the coasters. Themed coasters are a great idea and your turned out fantastic. I need to make a batch myself. Oh my son loves everything Halloween so even after the Halloween I have to take things down slow without him noticing so if I won this fabric I would make something just for him to keep in his room as long as he wants!!! Thanks again for the chance at your giveaway! Fingers crossed! Very cute coasters. Love the way you quilted them. Lovely coasters! I like quick and easy projects! ;) Thanks for the giveaway and Happy Halloween!! very cute coasters...they look great!! I would love to be entered in the draw. Those coasters are really cute and they would make excellent gifts for Christmas. I need to get busy! Very cute coasters. Thanks for the giveaway and for the tutorial. Such a cute and easy idea. I'll have to whip some up. What cute coasters and so simple to make! Thank you so much for the tutorial and for the give-away. The fabrics are really cute and perfect for Halloween. I might try some Christmas ones with scraps I have! I recognize that fabric! :) Very cute fabric and very cute project. Perfect way to keep the riings away! Love your coasters! What cute coasters! Halloween is one of my favorite holidays! Such a cute idea! Would love to have your "leftovers" for my stash for next year. I'll probably be adapting this idea for quick Christmas gifts! I follow via blogger, but I've also recently jumped on the Bloglovin' bandwagon, so I follow there too. Your coasters are so cute. Thanks for sharing your creativity and for a great give away. What a great idea. And easy, too. I'll be making some. Such a fun coaster method...very cute! Thanks for sharing! Super cute coasters Miss Kelly ! Thank you for the tutorial !! Love your blog....now following ! love these!! going to make for sure!! halloween, christmas, valentines........ thanks!! Your coasters are really cute and I like how you quilted them. Thanks for the chance to win the leftover fabric. Solo cute.. These are perfect for your cop of Cider. Thanks for sharing. Thank you for this great scrap-buster idea! Happy Halloween! your coasters are fantastic! great job! Really cute idea and I love that it's quick. Great idea for Christmas gifts too. very cute coasters, thanks for the demo. Would love to w in, thanks. What pretty coasters! Perfect for Halloween! I like the idea of seasonal coasters, they are great for a gift. following in sage feeds--thanks for the giveaway opportunity. Clever coaster idea! What fun fabrics you chose for the project. THX for sharing the tute. Super cute coaster for Halloween! Thanks for the inspiration! 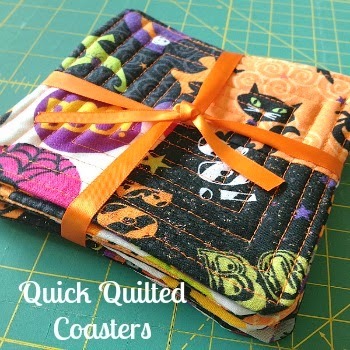 I thought about following your instructions for Christmas coasters... but would love to win the Halloween fabric. There's plenty of time to use the coasters before Christmas!! Love your coasters. Thanks for the instructions. I have put them in a word document and saved them so I can make Halloween and Christmas ones. Have some pumpkin fabric that would work both Halloween and Thanksgiving. Thanks again. Such cute little coasters and a great tut! Thanks for sharing and thanks for the giveaway! already started!! cut enough for 4 sets!! lol can never just do one!! are you on instagram? could link you to a picture when done! Really cute coasters. Such a great idea for Christmas gifts. Or birthday, or wedding shower, etc. Thanks so much for showing how to do them and also for the give away. Cute coasters and great tutorial. Love the Boo fabric. Great idea! Like them all! Love those coasters. I like having seasonal coasters out all the time. Great for playthings for the little ones who visit too. Great coasters and the tut looks like they are indeed easy. Thanks for sharing! Spooky:) Just kidding. Love the coasters. A fun holiday project that will not take forever! haha. Like most of my other ones. I follow you everywhere:) Stalker. I love the fabric and thank you for the tutorial. Also, thank you for the giveaway!! Happy Halloween!! Great coasters! That fabric is really cool! Kelly--I LOVE these! I made something sorta like this a while back, but I didn't piece the top or quilt them (yes I was just that lazy! ;-) ) and yours are so much more fun with the four patch toppers and the quilting. Awesome job, and thanks for the tutorial! such great little coasters - thanks so much for the tutorial and generous giveaway - thanks for sharing ! Happy Halloween. I love the fabrics you used for your four patch coasters. Thanks for the tutorial, thanks for sharing, and thanks for being so generous with your leftovers. What cute coasters! Love the fabric choices, they just make me smile. Very cute and super quick - just my style. I just check your blog everyday when i get a chance - does that count as following? Awww... cute fabric! I am following you via Bloglovin' - thanks!! Thank you for sharing your tutorial. Loving those coasters. Those coasters are BOO-tiful. Thank you for joining this Wicked Fun Hop. I love you coasters and thanks for the tutorial. Really cute coasters, and cute fabrics...thanks for the chance at the giveaway! Wonderful coasters! Thanks for the tut and the chance to win! I'm a new "follower by email"
Very cool coasters ... love the fabric you used. Thank you for the tutorial. These are so neat. Great quilting and the fabric is too cute. Love these and they are so handy to have around!! Thank you for sharing. Love your coasters, they're wicked! I think I'll try some too soon! Love the quilting on these, great work!! What a success. Your coasters are so cute ! As one of your readers I'll make a set of coasters for each season. Thank your for that lovely idea and tutorial. what a great idea to use up those bits and pieces..... an a great little gift idea as well. This year I used some of my bits and pieces to make a couple Halloween bibs for a little vampire that came for a visit and trick or treating. Thanks for the tut and the give away. I look forward to trying this out. Quick, simple and cute! What more could we ask for? I have signed up to follow your blog by email. These are terrific! I can't wait to get started making several sets of these for Christmas gifts - and a set for every season for myself! I follow you by email. I was out of town on a biz trip when I received the email for this latest blog post. Could not wait to get home so I could print out your tutorial and get started on making these adorable coasters! Gonna be a fun sewing weekend! Love your coasters. Great fabric. Fun! I've added your giveaway to the weekly link up on my blog. Very cute and they look simple enough for me to try! ;-) Thanks for the giveaway! Cute, cute, cute! What I love most is that it is an under an hour project. Gotta love those! Great job on the coasters. Thanks for the chance to win your leftovers!! How cute! What a fun fast project. I just made a bunch of coaster just like that. They are so easy. Your are so cute!!! I love them! Thank you for the give away! Now why didn't I think of that?! That is so cute and useful, as well as EASY! !